If you’re looking for the most affordable tree removal contractors then we’re the best fit for the job. Randburg is full of different trees in its streets, in residential areas and commercial ones as well. Undertaking the tree removal job on your own is not recommended, considering the level of expertise and the set of equipment that are needed to get the job done safely and effectively. With our reliable tree felling services in Randburg, we can get the job done effectively and with no reason to be worried or concerned. By contracting our Randburg services, you can ensure that the storm-damaged or diseased tree is removed swiftly and safely. 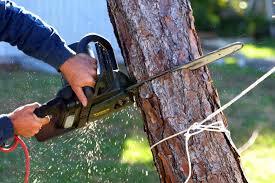 Our tree felling Randburg service use modern equipment and all our specialists are thoroughly vetted. Our advanced tree-removal equipment cuts down town all sizes of trees while causing no damage to your property. On top of this, we can do tree pruning in Randburg as opposed to removing them. We also provide additional services such as garden refuse removals as well as supply different things such as firewood supplies to cater for your needs. Do not gamble by hiring unqualified people to cut your trees done. Tree felling in Randburg requires expert tree removal contractors. These experts will ensure that there is no property damage as a result. So call us on 087 551 0614 for more information on our service or to request for an estimate.